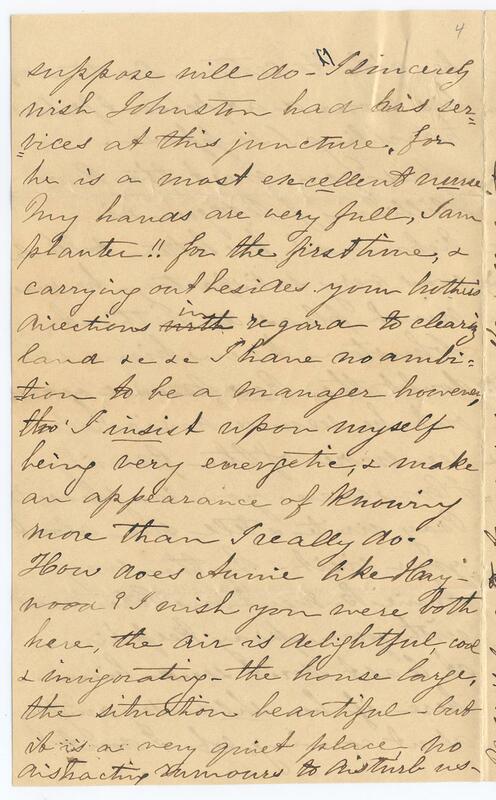 Item description: Letter, 27 June 1862, from Jane Caroline North Pettigrew (wife of Charles Lockhart Pettigrew) to her brother-in-law, William S. Pettigrew. 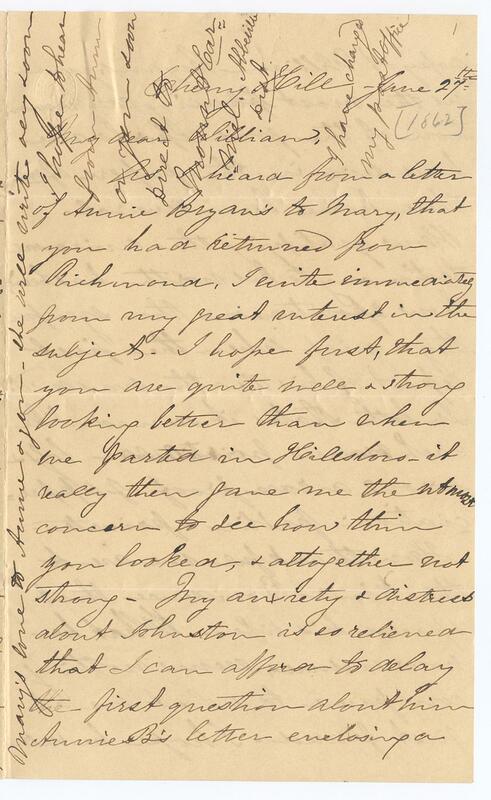 The letter illustrates how dispersed the Pettigrew family has become at this point in the war. The writer, Caroline, has been relocated from Bonarva Plantation in Tyrrell County, N.C., to another family home site at Cherry Hill Plantation, Abbeville, S.C., while Caroline’s husband Charles remains at Bonarva. 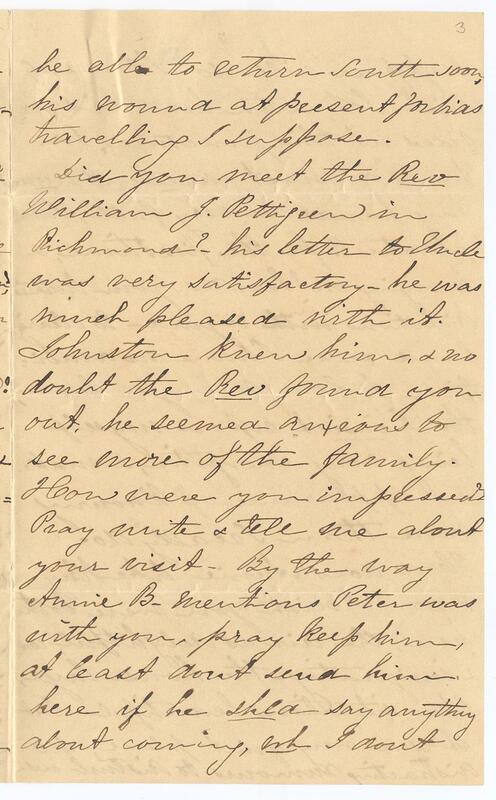 William Pettigrew has just returned from Richmond, Va., to his temporary home in Chatham County, N.C. He has returned with Peter, one of Charles’s slaves. Meanwhile, James Johnston Pettigrew (wounded and captured at the Battle of Seven Pines) is imprisoned at Fort Delaware, recovering from his wounds and awaiting exchange. 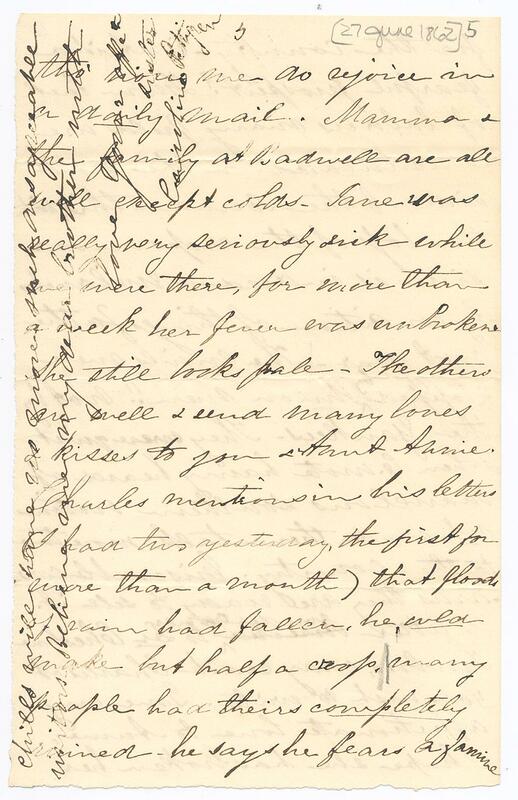 As I heard from a letter of Annie Bryan’s to Mary, that you had returned from Richmond, I write immediately from my great interest in the subject. I hope first, that you are quite well & strong looking better than when we parted in Hillsboro – it really then gave me the utmost concern to see how thin you looked, & altogether not strong. My anxiety & distress about Johnston is so relieved that I can afford to delay the first question about him. Annie B’s letter enclosing a copy of William Bryan’s, gave us the most pleasing confirmation of the good reports we had seen in the papers – of wh. there have been several. How gratifying the universal testimony to his worth has been, how spontaneous the sympathy & grief when the first report of his death was rec’d! In both state it seemed like each man’s particular loss & sorrow, a rare proof of appreciation public & private. How thankful we are to the kind Providence that spared his life. What he now endures, seems nothing compared to what we at first feared. I hope he will be able to return south soon, his wound at present forbids travelling I suppose. Did you meet the Rev. William J. Pettigrew in Richmond? his letter to Uncle was very satisfactory. he was much pleased with it. Johnston knew him, & no doubt the Rev. found you out. he seemed anxious to see more of the family. How were you impressed? Pray write & tell me about your visit. By the way Annie B. mentions Peter was with you, pray keep him at least don’t send him here if he shld say anything about coming, wh. I don’t suppose will do. I sincerely wish Johnston had his services at this juncture, for he is a most excellent nurse. My hands are very full, I am planter!! for the first time, & carrying out besides your brother’s directions in regard to clearing land &c &c I have no ambition to be a manager however, tho’ I insist upon myself being very energetic, & make an appearance of knowing more than I really do. How does Annie like Haywood? I wish you were both here, the air is delightful, cool & invigorating. the house large, the situation beautiful. but it is a very quiet place, no distracting rumours to disturb us. tho’ now we do rejoice in a daily mail. Mamma & the family at Badwell are all well except colds. Jane was really very seriously sick while we were there, for more than a week her fever was unbroken. She still looks pale. The others are well & send many loves & kisses to you & Aunt Annie. 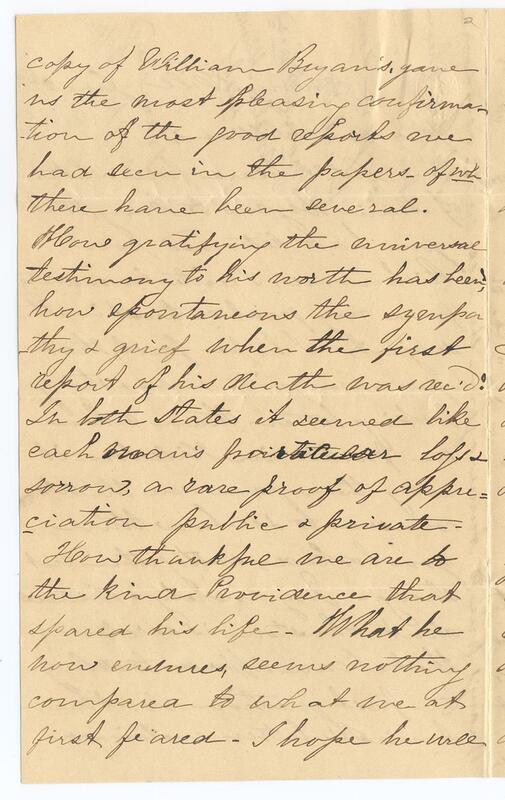 Charles mentions in his letters (I had two yesterday, the first for more than a month) that flood of rain had fallen. he wld make but half a crop. many people had theirs completely ruined. he says he fears a famine for the country. isn’t it a fearful prospect? From lack of laborers many fields are uncultivated, on the north side of the sound. this, with the loss of the crops on our side is indeed a melancholy condition of things for the next year. Mary’s love to Annie & you. she will write very soon. I hope to hear from Annie or you soon. Direct to Mount Carmel, Abbeville Dist. I have changed my post office. 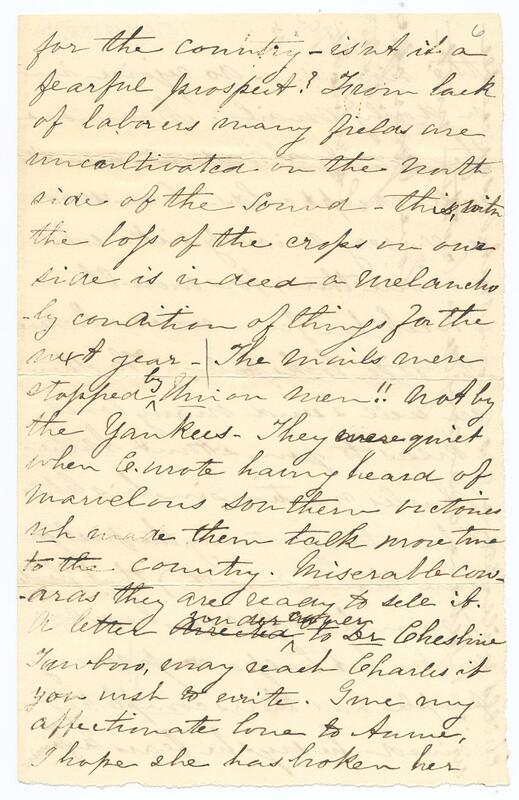 This entry was posted in Southern Historical Collection and tagged body servants, Charles Pettigrew, Chatham County, Cherry Hill Plantation, home front, James Johnston Pettigrew, Jane Caroline "Carey" North Pettigrew, North Carolina, Peter, Pettigrew family, plantations, slavery, slaves, South Carolina, William S. Pettigrew. Bookmark the permalink.